If you follow the news you have probably come across coverage of the canine flu epidemic that has hit our neighbors to the northwest in Chicago. Reports estimate that thousands of dogs have been infected in the Windy City and that some cases have spilled over into Michigan and Ohio as well. With the glut of reports on this outbreak it’s important for pet owners in the Hoosier State to know if it could affect them, and if so, how. The particular strain of flu virus that has caused the current epidemic in Chicago has not been previously seen in the United States. A recent report in the Chicago Sun Times points to evidence in studies by scientists at Cornell University and the University of Wisconsin that the outbreak was caused by the H3N2 strain and not H3N8 as originally reported. H3N2 has been found to be widely circulated among dog populations in southern China and South Korea the Sun Times states. There is no evidence that this strain of the virus can be transmitted from canines to humans. But there is evidence to suggest that humans can transmit the disease to another dog after coming into contact with a sick pup. According to the ASPCA canine flu is transmitted through a combination of aerosols, droplets and direct contact with respiratory secretions. A vaccine to combat canine flu does exist but it is not known if it will completely protect dogs from this strain of the virus. Donna Alexander, the administrator of the Cook County Department of Animal and Rabies Control, is quoted in the Sun Times article that the vaccine “does impart enough of an immunity that it may protect the animal’s life. It may make the difference between it being a fatality and a severe hacking cough that the animal can withstand.” Additionally, according to the Indiana State Board of Animal Health, the vaccine is not effective in dogs already infected with the canine flu. Media reports currently attribute five deaths, of the over 1,000 infected, to the current canine flu outbreak. If you notice any of the following signs in your dog contact your family veterinarian immediately. If their office is closed, our emergency department is open 24-7-365 and can provide help. The Indiana State Board of Animal Health encourages dog owners to not panic. 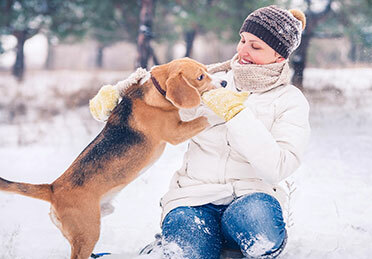 Dogs who are in good health but contract canine flu are likely to recover. Extremely old, extremely young and immuno-suppressed dogs are at the highest risk, should they become exposed to canine flu. Risk of exposure for dogs in the Indianapolis area is low. If you are planning to travel to the Chicago area, it is recommended that you vaccinate your pets prior to visiting the city. Antibiotics and supportive care have been shown to be successful in treating dogs who are exposed to canine flu.